to analyze for the complete polymeric system, which includes volatile and semi-volatile compounds and the actual polymer. But using a pyrolyzer as a “thermal extracting introduction system” in combination with any industry standard GCMS provides a simple and direct means of analyzing not only the additives, but also the polymer itself. By careful selection of the sampling temperature, volatile and semi-volatile compounds may be liberated from the polymer matrix for analysis without the use of solvents or complex sample preparation. The remaining sample may then be pyrolyzed to identify the type and even structure of the polymer used in its fabrication. A typical series of analyses includes a low temperature assessment to identify volatile additives, contaminants and residuals, such as solvents and retained monomer. An intermediate temperature is used to investigate semi-volatiles like antioxidants, plasticizers and lubricants. Finally, at pyrolysis temperatures, the polymer itself may be identified and studied. In addition, there are commercially available libraries developed to help identify different categories of additives and polymers using the search programs from the GCMS system. 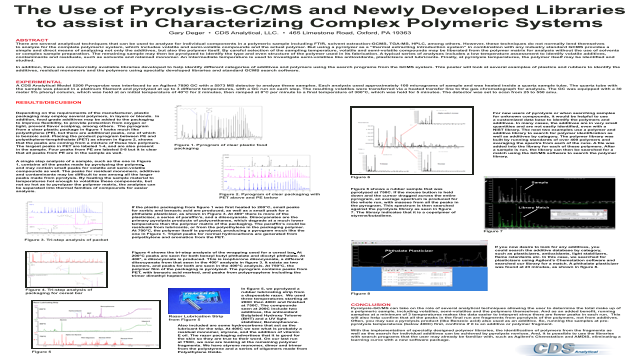 This poster will look at several examples of plastics and rubbers to identify the additives, residual monomers and the polymers using specially developed libraries and standard GCMS search software.